Mission Springs Brewing Company in Mission BC is around 6 months into a big change at the brewery. A new Brewmaster Kevin was brought in, as well as a whole new brewing team. A few beers have been let go from their lineup and the rest have been tweaked. There are even a few tricks are up Kevin’s sleeves from the sound of it! On March 12th, 2013 I was able to meet up with Kevin for a quick tour of Mission Springs smaller (tiny) brewery on the upper level of the brewpub. This tiny brewery looks out over the bar and restaurant at Mission Springs. 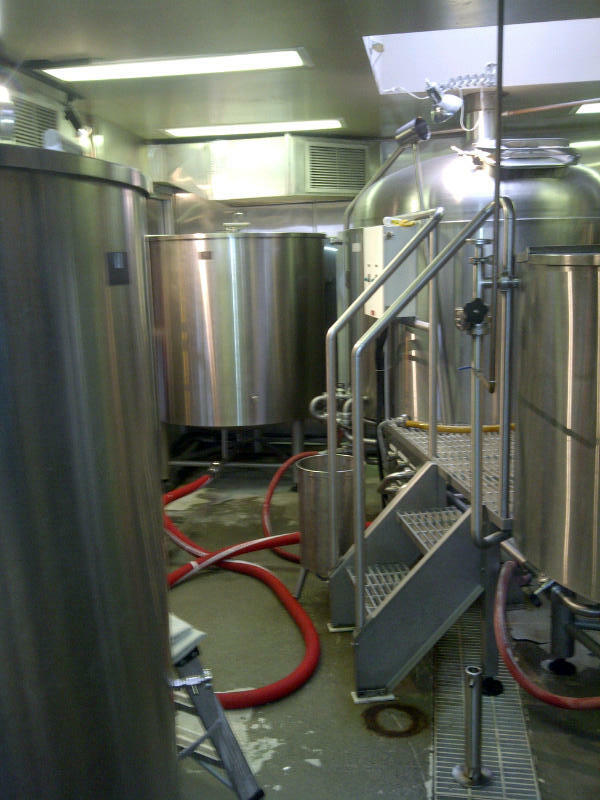 This portion of the brewery is more or less used to brew the beer for in house consumption from what I gathered. This is not your average North American brewery as the fermentors are not a closed system. First off most Mash Tuns are agitated by some kind or large stirring mechanism. This is not the case at this brewery! Here they use an old style of brewing where the mash is not stirred. The bottom of the mash tun is slotted and these slots are covered in mesh to only allow the liquor (heated mixture of water and milled grains) to pass through. This liquor is drawn off and then passed back into the mash tun multiple times. This process helps to create great rich flavours. Once the correct mixture is created it is passed onto the kettle to boil for a period of time. Once this step is done it is sent onto the open fermentors and yeast is added. 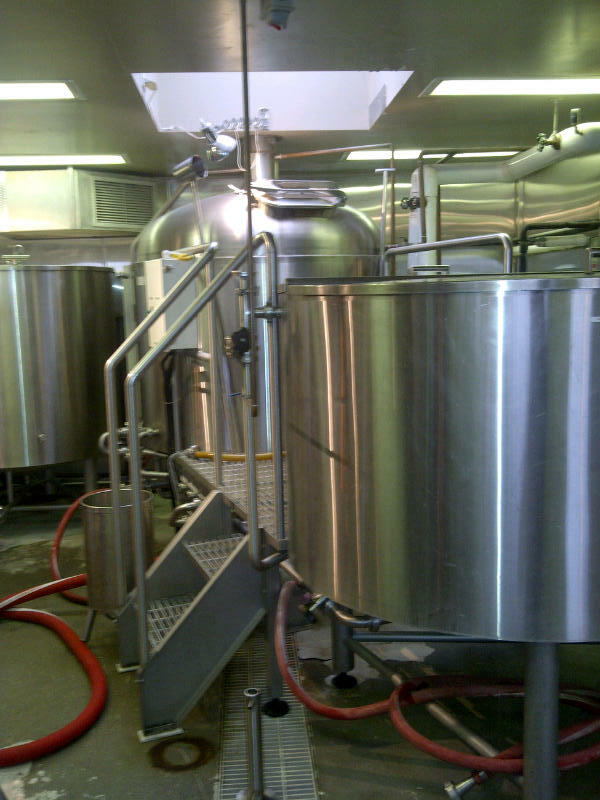 This stage requires a very clean brewery as any impurities can cause the beer to go off! We sure do not want that! Yes this is the entire extent of the Upstairs Brewery! It is tiny! One thing to be excited about is that there is a new bottling line on order that should be arriving soon that will increase the breweries bottling capacity. They are currently on a manual line that fills only two or three bombers at a time (eek). You should be able to find there beer far more often at a store near you in the fairly near future. I would like to point out that Kevin is very excited at where the brewery is headed and has some new brews coming down the pipe fairly soon. He also has some pretty grand plans on where the brewery could end up in the future. Keep your eyes locked on Mission Springs in the future here as we could be in for a fun ride. I look forward to seeing what their lower level brewery looks like the next time that Kevin and I can meet up and he has more time. This entry was posted in Brewery and tagged bc, beer, brewery, brewing, canada, mission springs, mission springs brewing co, open system. Good timing on this one. I would love to get out there soon! No doubt about the good timing. What’s the chance we write posts on the same brewery on the same day again? Lol. If you aree heading out there try to drop the brewmaster a line at @kwpints the day before. If he has time he will probably give you a tour. Pretty random, says something about the rejuvenation though. MS is doing something right. Hopefully next week I can make it out.